The Scottish Government has finally revealed the preferred option for improving Sheriffhall roundabout. From the short listed 3 options, option B has been chosen which will build a flyover over an enlarged roundabout. The preferred option announcement has been delayed at least 16 months and now the project will enter a design phase which will take another two years to produce draft orders which will go for further comment. So residents in Midlothian can expect long traffic delays, especially in rush hour times for several years to come. In the meantime more housing goes ahead in Midlothian, East Lothain and Edinburgh which will just add to the the strain at this important roundabout. “Sheriffhall roundabout is a well-known bottleneck for motorists using the Edinburgh City Bypass. As the only junction on the A720 trunk road which is not grade-separated, it is often the scene of congestion and significant queuing, particularly at morning and evening peak times. 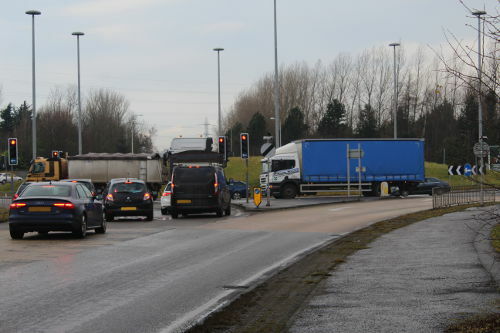 “The Scottish Government remains committed to delivering improvements at this busy junction and having let the public see and comment on the three emerging options late last year, we are now able to identify a preferred option. 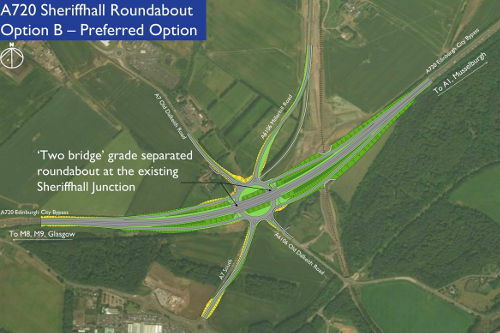 “The preferred option will grade separate the junction, separating local traffic from the strategic traffic on the bypass and will allow the traffic on the bypass to flow freely, improving road safety and journey times for all road users.